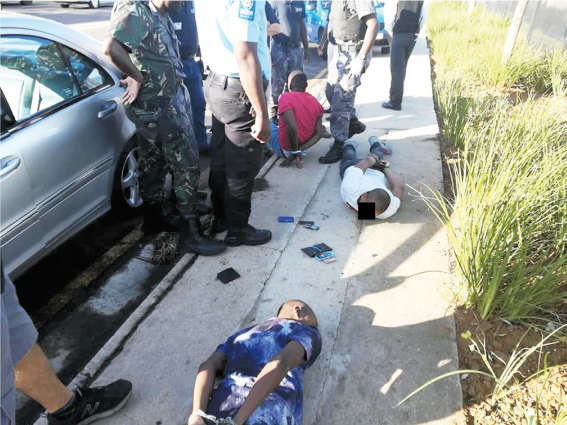 It was a crime spree cut short for three alleged auto teller machine (ATM) scammers when they were caught red-handed and cornered in a joint effort between Amanzimtoti Community Crime Prevention Organisation (CCPO) and ET Rapid Response members on Arbour Road on Saturday morning. CCPO representative George Snodey, who followed and aided in the arrest, said, “On Saturday morning, I happened to be checking the area out and at around 6.30am when I went past Victory Spar in Warner Beach, I noticed a suspicious character loitering around the ATM. “I decided to hold him under observation, and parked where I could watch him properly. Within five minutes of my stopping, I saw him interfere with someone at the ATM and then walk across the road. The suspect joined two other accomplices who were sitting in a silver Mercedes. “The suspects then drove off to DSM Mall where the same suspect got out and fiddled at the ATM before withdrawing some money. He then got back into the car and they headed for the freeway,” said Snodey. “The suspects joined the freeway northbound, whilst I followed from a distance. Unfortunately, with it being shift change for most SAPS and Metro Officers, I was unable to get anyone to assist to pull the vehicle off. “I called for back-up on the CCPO radios and Louis from ET waited for us just before the Galleria Mall. The suspects took Arbour Road and fearing they would leave the area, Louis and I decided to box them in. We then got them out of the vehicle and ensured that they were immobilized,” Snodey added. “The suspects claimed to have robbed a person of his SASSA card and withdrew R1 700 from the Winklespruit ATM. SAPS arrived and found nearly R4000 on the suspects who claimed they tore the SASSA card up and threw it away,” Snodey said.